Andy Rathbone » How do I right-click on a touch-screen tablet? Q: I have a new Windows tablet PC, but I’ve always used Apple computers until now. Now I want to transfer a large number of files from my Mac to my tablet PC using a flash drive. I have several questions, but to let you know the extent of my ‘dummy-ness’, what is a ‘right click’? My tablet uses a stylus (also a virtual keyboard which I don’t know how to use), and no mouse. A: First, welcome to the world of Windows tablets. Many more of you will join the party when the tablet-friendly Windows 8 becomes mainstream. As you’ve noticed, Apple hasn’t embraced right-clicking as much as Windows. All Windows mice, by contrast, come with at least two buttons. Click something with the handy right-mouse button, and a list appears showing everything you can do with that particular item — a handy trick when navigating uncharted seas. Although tablets traditionally use finger controls, the trusty right-click menu hasn’t disappeared. Touch the item with your finger or stylus, and keep the finger or stylus pressed down gently. In a moment, a square or circle will appear, shown in the top, left figure. Lift your finger or stylus, and the right-click menu appears, listing all the things you can do with that item. 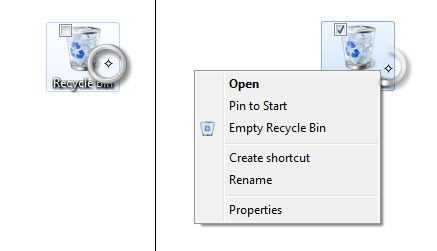 In this case, it’s the Recycle Bin, shown to the right in the figure above. If you’re using a Surface tablet with a snap-on cover, you can use the trackpad to position the arrow over the item you want to right-click; then tap both fingers down on the trackpad. The right-click menu appears. On the tablet, select the files or folders you want copied from the flash drive. Choose Copy from the right-click menu. Right-click inside folder where you want to put the items. Choose Paste from the right-click menu. When you’re at your desk, that extra keyboard and/or mouse will turn your tablet into a full-fledged PC. One more thing: Check your stylus; on some of the more expensive tablets, the stylus has a button on its side. Pushing the button while pointing at an item also fetches the right-click menu. That’s the same menu you see when you click a mouse’s right button on a Windows computer. For more information about Microsoft’s Surface tablet, buy my book, Surface For Dummies, 2nd Edition, available on Amazon. 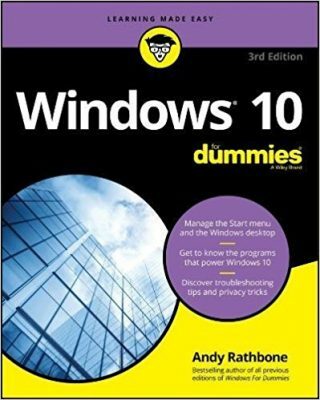 Posted: March 12th, 2012 under Surface For Dummies, Windows 7, Windows 8, Windows 8 For Dummies, Windows 8 For Tablets For Dummies, Windows RT. Have you ever used a Mac? “As you’ve noticed, Apple computers lack a right-click menu. Their mice only have one button.” That is just stupid and incorrect. Billy – No, I haven’t used a Mac for many years. My books, and this blog, are about Windows. Thanks for your correction, and I’ve updated the post. Be aware, though, that MacBook laptops don’t have a right-click button. I had a new lap top/tablet “Dell inspiron duo” i wanted to use right click when in tablet position…..and your instructions were perfect, I just kept my finger on the icon and a ring came and when I removed my finger the right click menu came out. Thank you so much. To right click on a mac click on the right side of the button. Works for me anyway. This seems to work for right-click menus. It does not seem to work in games, like Yahoo pool. There, left mouse button aims, right draws back and release to shoot. I tried holding down my finger, but that had no effect. Any suggestions? Eric: For games like Yahoo Pool, where timing of the right-click is an integral part of the game, you’ll need to use a mouse with your Windows tablet. A Bluetooth or USB mouse should work, but a USB mouse might give slightly better timing control. Thanks for this article. Very helpful.